Deaf dog: Beamer is a 7 week old Pit Bull puppy. Her family says "We just bought Beamer 3 days ago. She wasn't responding to noises like our other dogs did. We took her to our vet who confirmed our suspicions of Beamer's lack of hearing. Beamer was purchased not only as a family pet but also as a therapeutic companion for boys with discipline and behavioral problems. The intent is to have Beamer hike the 28 day learning trip into the mountains. Her job being not only to pack her own stuff in, but to help the children in ways that people can't. Including to warn them of impending danger. Since we've gotten Beamer, we are still hopeful that she'll be able to participate in the program. We just need a little bit of training advice, support, and a whole lot of patience!!" Human companions: Charlene LeMay, One adult male, three children under ten. Other pets: Two other dogs and three cats! 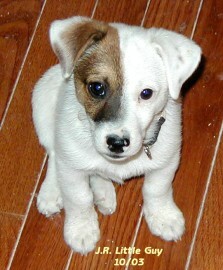 Deaf dog: J.R. Little Guy is an 11 week old Jack Russell Terrier. "J.R. came to us as an orphan whose owner had sold him and received him back when it was discovered that he was deaf. My brother, a professional trainer, asked me if I wanted to adopt a little deaf guy. Always up for a challenge and trusting my brother, I said sure. It took, at the most, 2 seconds for our family to fall in love with this high energy, bundle of affection! He is very sweet and extremely smart. When he came to us, he was very ill with Corona and had to be hospitalized for 5 days. We didn't hear him bark until the day we picked him up from the vets. It was a joyous sound indeed! In only 2 weeks time, he has learned 3 basic commands and 6 ASL signs. He had doubled his weight and now is a whopping 3.2 pounds! I assist my in-laws in their twilight years and J.R. has added much needed interest and laughter to their days. We are thankful to God for this little gift!" Human companions: Lynda and Chick Munfrada, daughter Stephanie, 22 and son Michael, 16. 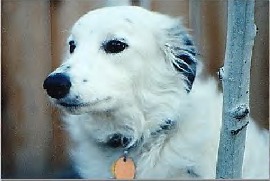 Deaf dog: Snowden is a 3 year old Border Collie. "I work for a vet clinic and one day someone brought in 8 puppies to be euthanized. Their mother had been shot and they didn't want to deal with raising puppies. They were 2 days old. My vet wouldn't put them down. A co-worker and I split up the group, we each had 1 male and 3 females. One of mine was all white. When the pups were about 4 weeks old, I noticed the white one didn't wake up when I hollered at them. I slapped my hands over her and nothing. Couldn't hear a thing. Three years later she is still with me, along with the other two sisters,(Raven and Willow) plus one(Megan) from my co-workers group. I took Snowden through obedience and she was the top of the class. Since she cannot hear, there aren't as many distractions. She knows several had signals and I have been able to teach her to "go" in which I send her out to something." Other pets: Many other pets, including more Border Collies, some GSD/wolf dogs and Boerboels.